We all know dogs offer us so much more than just being our pets. We recently wrote an article about how dogs are trained to detect diseased beehives to help save bees and our food chain. 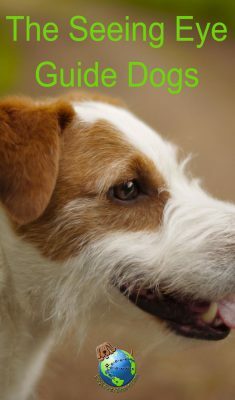 We also wrote another article on how to cope with your blind dog. But the reverse takes place with the Seeing Eye program where dogs are trained to help the visually impaired. In 1929, the Seeing Eye was founded to teach the visually impaired to work with dogs that have been trained to guide those in need. The Seeing Eye, which was founded by a blind salesman and a dog trainer, is still currently operating. They breed and train dogs to become guide dogs and connect the dogs with the impaired. They have been on a mission to help others and their numbers show how successful they have been! Every year the Seeing Eye holds 12 to 13 class sessions. Each session allows up to 24 students to join and go on to graduate from the Seeing Eye program. As of January 2017, the Seeing Eye has taught 7,789 graduates through their program. Wow, that’s a mighty number for such a niche cause! Before the dogs enter into the program to work with the students and the impaired, they must be socialized properly. About 600 families have taken on this duty by helping raise puppies before they begin training as guide dogs. Once the dogs are trained, they are partnered with humans in need. Altogether, the Seeing Eye has partnered 16,745 dogs with their humans. The trained pooches go home with their visually impaired owners, which happen to be spread across all of the 50 states throughout America!